The Ministerial Law Committee on Sunday approved for legislation a new law that would automatically place a sentence of five years on an Israeli who was convicted of belonging to a terror organization. The legislation would apply to organizations such as ISIS, Hamas, Al Qaeda, and other terror groups. The law was proposed by Justice Minister Tzipi Livni (HaTnua). It must now be approved by Defense Minister Moshe Ya’alon (Likud) and Foreign Minister Avigdor Liberman (Yisrael Beytenu). Ya’alon will then specify the organizations and countries or regions in which the law would apply. Violators could be sentenced to up to five years in Israeli prison. Officials did not comment when asked by reporters if Fatah – the terror group that is headed by Palestinian Authority chief Mahmoud Abbas – would be included in the list. 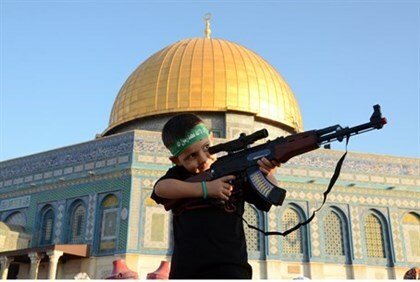 “Every country has the right to self-defense, and Israel is no exception,” Livni stated Saturday night. “We cannot let terrorism in, and so we must subject Israeli citizens who join terror organizations due to extreme Islamist ideologies to the full prosecution under law. “This legislation is an internal action, but it is important as a means of accompanying the external processes of creating a common mission with the West and the Arab states against fundamentalist Islam,” she added. Several incidents of Israeli Arabs traveling to join ISIS in Syria have hit headlines in recent weeks, including the first Israeli citizen to be convicted and sentenced for joining the group after he returned from his stint in Syria. But there have been many more cases of Israeli Arabs working for terrorist groups closer to home – including Hamas and Hezbollah. ← How did a Shia Muslim and Hezbollah commander become Rabbi Avraham Sinai of Tzfat?